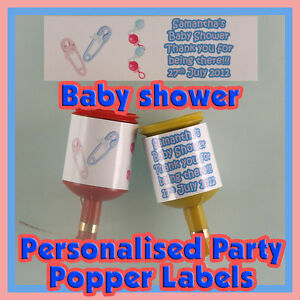 Details about Personalised BABY SHOWER Party popper LABELS - Self adhesive - Pre-cut x24 !!! Personalised BABY SHOWER Party popper LABELS - Self adhesive - Pre-cut x24 !!! Pay through Paypal and then send image to jlewis.courtwood@virgin.net or images@courtwood.co.uk. Any questions please do not hesitate to call us on 01736 741222. Thank you.